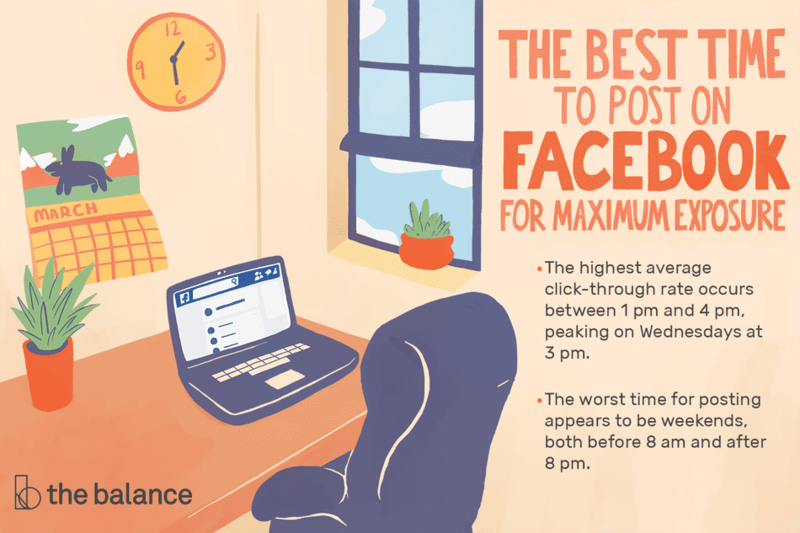 Looking for the best time to post on Facebook to get the most amount of reach, engagement, and sales? In this article, we'll look at the best times to post on Facebook based on what business you're in and what market you serve. As an online entrepreneur, you are constantly tweaking your social media business strategies in order to better reach your target market. However, as the rules of the social media marketing game keep changing and new opportunities arise, keeping up with best practices can be tricky and challenging. There's no question about whether or not social media works when it comes to driving traffic to your website, raising brand awareness online, generating email subscribers, and ultimately increasing sales online. More and more big companies, small businesses, and entrepreneurs are tapping into the power of social media to reach their audience, engage with them, drive traffic, and generate sales. With all of the opportunities available the question of where to start and what to focus on can be overwhelming. Unless you're a huge company with a big advertising budget and ad team; you're most likely dealing with limited time and money so you want to make sure you're focusing your efforts in the right places to get the most bang for your buck (and time). Rather than trying to be on all social media channels all at once and spreading yourself to thin, you'll be better off focusing on just a select amount of channels and getting as much as you can get out of them; then explore moving into other social media channels. While there is no magic formula that will make you a social media wizard overnight, you can start by optimizing your performance on one social networking site at a time. Though every business is different and everyone's mileage may vary, it's a safe bet for most businesses that Facebook is one of the best social media channels to start with when it comes to reaching your audience, driving traffic, and making sales. Chances are that regardless of who your market is or what your business is, due to the size and reach of Facebook, you have a very good chance at reaching your prospects on Facebook. When it comes to posting on Facebook (or any other social media channels) one of the most common questions that come up is, "What is the best time to post on Facebook?". Do yourself a favor. For thirty (30) days, concentrate using Facebook to market and promote your business. It's arguably the world's biggest online network, so even a slight improvement in your Facebook activity can mean a lot for your business. Because so many people are on Facebook, there is a high probability that you can reach your market; no matter what business you are in or what market you serve. The highest average click-through rate (CTR) (meaning the number of people who will click on the links on your posts or ads on Facebook) occurs between 1 pm and 4 pm, peaking on Wednesdays at 3 pm. The worst time for posting appears to be weekends, both before 8 am and after 8 pm. Adding photos or images boosts engagement - fifty percent more 'Likes' and double the number of comments. Right now videos and Facebook Live are getting significant more reach than regular posts. Based on these "general" trends (more on that later), depending on the particular goal of each of your posts will potentially determine when you decide to publish that posts. Are you looking to have your material shared? In that case, make your posts at 1 pm. People seem to be in a giving mood at this time, and while they may not go through your post in detail for themselves yet, they are inclined to give work colleagues and friends a look. While you may get more clicks on a Wednesday, don't count out Thursdays and Fridays for true user engagement. People often need 12-24 hours to warm up to your thoughts, as indicated by a 6-7% increase over the Monday to Wednesday period. Perhaps not surprisingly, Facebook's so-called “Happiness” index is ten percent higher on Fridays than during the rest of the workweek. How can these factors influence your Facebook strategy? Evidently, you can try posting new material during the daily 'afternoon slump' right after lunch. People are often sluggish after their midday meal and use Facebook to get the juices flowing and catch up with recent events before returning to work. This can be the ideal time to engage them with pure marketing content; content that you would like to be shared reach more people and not necessarily sales related content where you'd want people to click-through. Similarly, why not hold off on your explosive end of workweek Facebook posts until next Monday? Chances are that they'll not be read on the weekend. After all, many people are inclined to take a break from social media in favor of outdoor family activities, household chores and the like. Perhaps you do the same? The exception to this could be a hobby niche; where people are more likely to engage with hobby or fun related businesses while taking a break from work or business related posts. You may want to schedule your posts in advance or hire a social media marketing manager to manage your Facebook presence. A good social media marketing manager can also help you with online reputation management. Now that we've looked at some of these general trends, there is an even more powerful method you can use to determine the optimal posting times based on your own audience -- by using Facebook Insights. In your Facebook Insights, which is basically just the user behavior of your own Facebook followers, you'll be able to see exactly when your audience is mostly likely to engage with your own Facebook page. Do the majority of your Facebook followers engage with your posts on weekday evenings? Then you should do more posts on weekday evenings. Or does your page get most of it's activity on weekends?Then obviously you'll want to do more posting on weekend. There is a plethora of information and data Facebook will tell you about how people use and interact on your page -- and ultimately that will be the best way to guide your Facebook posts. In addition to this, you can learn a lot about the demographics and psychographics of your followers and the people who engage with you on Facebook the most. This can play a significant role in targeting your paid ads on Facebook. Timing your Facebook posts properly can be as important to the success of a campaign as the posted content itself. It can mean the difference between an explosive breakthrough and a massive failure. Social media is increasingly a vital part of modern businesses. Given the 24/7 nature of the Internet, you may think that timing your posts is not a big deal. However, this would be a mistake. Review your posting schedule to better reach your target audience and get the most out of your Facebook posts; whether you are looking to reach more people, get more engagement, or get more clicks to your website to build your list or generate more sales.